Applying color to marble is an ancient technique that artisans in Greece and Rome used thousands of years ago. You can employ the same basic strategies as the ancient masters who carved and built with marble. Marble tiles have pores that allow them to absorb color, but you must use oil-based instead of water-based dye. Know that the irregularities of stone will cause the dye to move and spread in unexpected ways. You can stain and dye marble tiles with care and patience. Mix the dye and paraffin in the cup over the hot plate until the wax melts and the dye is completely incorporated. Start with about 8 oz. of paraffin, then add dye in small batches until you see the color you want. Add rubbing alcohol slowly while mixing until the consistency is smooth but not dribbling. When you lift out your brush, the stain should form an unbroken stream as it falls off the brush. Heat the marble tile with a heat gun or iron set on the highest temperature for at least five minutes. If you use an iron, set the iron directly on the stone for best heat transfer. Keep the heat moving so you don't create one hot spot -- instead, try to heat the entire tile at once. The hotter the tile, the more easily it will absorb the stain. Brush on the stain quickly and evenly with the sponge brush. Don't slop or splash, but brush evenly across the entire surface of the tile. Keep the remainder of the stain on the hot plate so the paraffin will remain liquid. Wait for the tile to cool completely. 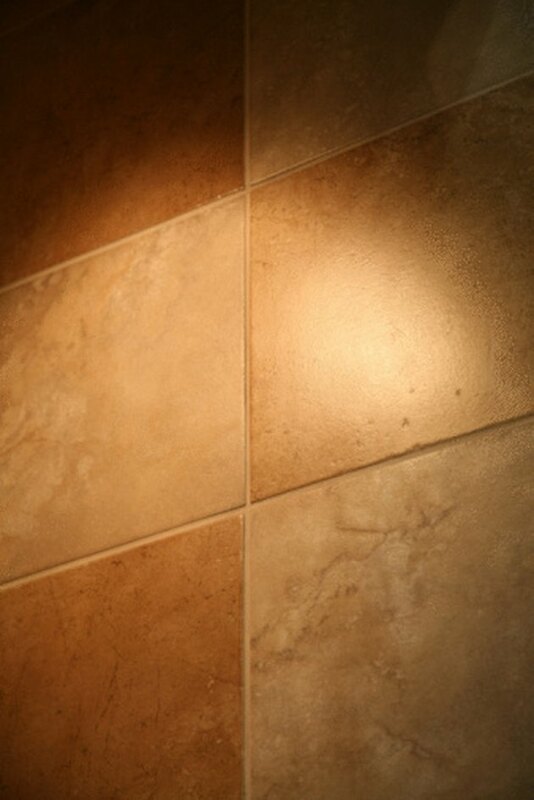 Polish the surface of the tile with a clean rag until it shines. Apply additional coats if you want a darker color. Repeat the heating and staining process as many times as necessary. Seal the marble with a stone and marble sealant when you finish staining. This will lock the color in and protect the marble from other stains. Follow the manufacturer's instructions for using the seal.